Gluons are elementary particles that act as the exchange particles (or gauge bosons) for the strong force between quarks, analogous to the exchange of photons in the electromagnetic force between two charged particles. The gluon is a vector boson; like the photon, it has a spin of 1. While massive spin-1 particles have three polarization states, massless gauge bosons like the gluon have only two polarization states because gauge invariance requires the polarization to be transverse. In quantum field theory, unbroken gauge invariance requires that gauge bosons have zero mass (experiment limits the gluon's rest mass to less than a few meV/c2). The gluon has negative intrinsic parity. This may be difficult to understand intuitively. Quarks carry three types of color charge; antiquarks carry three types of anticolor. Gluons may be thought of as carrying both color and anticolor, but to correctly understand how they are combined, it is necessary to consider the mathematics of color charge in more detail. These are equivalent to the Gell-Mann matrices; the translation between the two is that red-antired is the upper-left matrix entry, red-antiblue is the upper middle entry, blue-antigreen is the middle right entry, and so on. The critical feature of these particular eight states is that they are linearly independent, and also independent of the singlet state; there is no way to add any combination of states to produce any other. (It is also impossible to add them to make rr, gg, or bb otherwise the forbidden singlet state could also be made.) There are many other possible choices, but all are mathematically equivalent, at least equally complex, and give the same physical results. Technically, QCD is a gauge theory with SU(3) gauge symmetry. Quarks are introduced as spinor fields in Nf flavors, each in the fundamental representation (triplet, denoted 3) of the color gauge group, SU(3). The gluons are vector fields in the adjoint representation (octets, denoted 8) of color SU(3). For a general gauge group, the number of force-carriers (like photons or gluons) is always equal to the dimension of the adjoint representation. For the simple case of SU(N), the dimension of this representation is N2 − 1. In terms of group theory, the assertion that there are no color singlet gluons is simply the statement that quantum chromodynamics has an SU(3) rather than a U(3) symmetry. There is no known a priori reason for one group to be preferred over the other, but as discussed above, the experimental evidence supports SU(3). Since gluons themselves carry color charge, they participate in strong interactions. These gluon-gluon interactions constrain color fields to string-like objects called "flux tubes", which exert constant force when stretched. Due to this force, quarks are confined within composite particles called hadrons. This effectively limits the range of the strong interaction to 10−15 meters, roughly the size of an atomic nucleus. Beyond a certain distance, the energy of the flux tube binding two quarks increases linearly. At a large enough distance, it becomes energetically more favorable to pull a quark-antiquark pair out of the vacuum rather than increase the length of the flux tube. Although in the normal phase of QCD single gluons may not travel freely, it is predicted that there exist hadrons that are formed entirely of gluons — called glueballs. There are also conjectures about other exotic hadrons in which real gluons (as opposed to virtual ones found in ordinary hadrons) would be primary constituents. Beyond the normal phase of QCD (at extreme temperatures and pressures), quark gluon plasma forms. In such a plasma there are no hadrons; quarks and gluons become free particles. Quarks and gluons (colored) manifest themselves by fragmenting into more quarks and gluons, which in turn hadronize into normal (colorless) particles, correlated in jets. As shown in 1978 summer conferences the PLUTO experiments at the electron-positron collider DORIS (DESY) reported the first evidence that the hadronic decays of the very narrow resonance Y(9.46) could be interpreted as three-jet event topologies produced by three gluons. Later published analyses by the same experiment confirmed this interpretation and also the spin 1 nature of the gluon (see also the recollection and PLUTO experiments). In summer 1979 at higher energies at the electron-positron collider PETRA (DESY) again three-jet topologies were observed, now interpreted as qq gluon bremsstrahlung, now clearly visible, by TASSO, MARK-J and PLUTO experiments (later in 1980 also by JADE). The spin 1 of the gluon was confirmed in 1980 by TASSO and PLUTO experiments (see also the review). In 1991 a subsequent experiment at the LEP storage ring at CERN again confirmed this result. The gluons play an important role in the elementary strong interactions between quarks and gluons, described by QCD and studied particularly at the electron-proton collider HERA at DESY. The number and momentum distribution of the gluons in the proton (gluon density) have been measured by two experiments, H1 and ZEUS, in the years 1996 till today (2012). 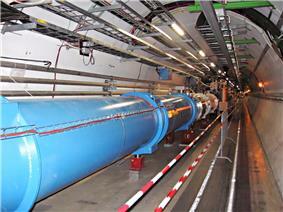 The gluon contribution to the proton spin has been studied by the HERMES experiment at HERA. The gluon density in the photon (when behaving hadronically) has also been measured. ^ M. Gell-Mann (1962). "Symmetries of Baryons and Mesons". ^ a b c B.R. Stella and H.-J. Meyer (2011). "Y(9.46 GeV) and the gluon discovery (a critical recollection of PLUTO results)". ^ a b P. Söding (2010). "On the discovery of the gluon". ^ a b W.-M. Yao et al. (2006). "Review of Particle Physics". ^ F. Yndurain (1995). "Limits on the mass of the gluon". ^ C.R. Nave. "The Color Force". ^ a b c d e Introduction to Elementary Particles. ^ Ch. Berger et al. (PLUTO Collaboration) (1979). "Jet analysis of the Y(9.46) decay into charged hadrons". ^ Ch. Berger et al. (PLUTO Collaboration) (1981). "Topology of the Y decay". ^ D.P. Barber et al. (MARK-J collaboration) (1979). "Discovery of Three-Jet Events and a Test of Quantum Chromodynamics at PETRA". ^ Ch. Berger et al. (PLUTO Collaboration) (1979). "Evidence for Gluon Bremsstrahlung in e+e− Annihilations at High Energies". ^ W. Bartel et al. (JADE Collaboration) (1980). "Observation of planar three-jet events in e+e− annihilation and evidence for gluon bremsstrahlung". ^ Ch. Berger et al. (PLUTO Collaboration) (1980). "A study of multi-jet events in e+e− annihilation". ^ L. Lindeman (H1 and ZEUS collaborations) (1997). "Proton structure functions and gluon density at HERA". ^ C. Adloff et al. (H1 collaboration) (1999). "Charged particle cross sections in the photoproduction and extraction of the gluon density in the photon". ^ M. Chalmers (6 March 2009). "Top result for Tevatron". ^ M.C. Abreu et al. (2000). "Evidence for deconfinement of quark and antiquark from the J/Ψ suppression pattern measured in Pb-Pb collisions at the CERN SpS". ^ D. Overbye (15 February 2010). "In Brookhaven Collider, Scientists Briefly Break a Law of Nature". A. Ali and G. Kramer (2011). "JETS and QCD: A historical review of the discovery of the quark and gluon jets and its impact on QCD".